Build a custom creature and put it into your hand. Fabricate is a rare Neutral action card. It is part of the Clockwork City story set. 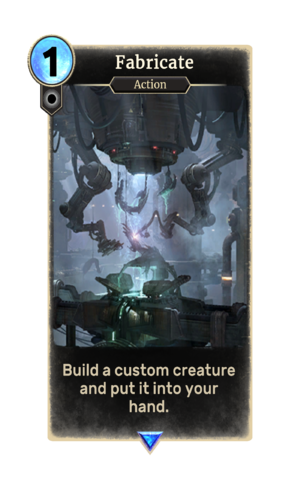 When you summon this card, you'll get to choose between three different versions of Custom Fabricant. Their cost, attack, and health values are random, but will always be in ascending order. For example, the values of version one can be anywhere between 1 and 10[verification needed — never got higher than 7 for now] and the values of version two can range between 2 and 11, but will always be higher than the values of version one and lower then those of version three and the values of version three will range between 3-12. Summon: You gain 2 health. Summon: Give another creature +1/+1. A playset of the card is awarded for completing The Tools. The premium version can only be obtained by soul-summoning, which is only possible after the completion of The Tools.